When i got home after my little overnighter with my brother i could tell my girlfriend was feeling neglected and in need of some 'nature'. Not needing any excuse to get out again i whipped together some haloumi and veg kebabs, grabbed my AGG stove, a disposable bbq and a couple of whole fresh mackeral and headed off to Kimmeridge. 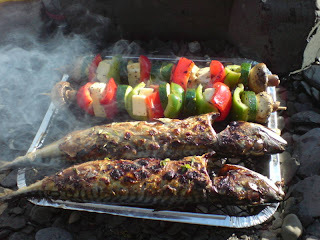 Whilst my girlfriend went beachcombing for fossils and lay in the sunshine i got down to throwing the food on the grill. It was a great way to finish the weekend, the food was great and a hot chocolate drink, stirred with a shard of chocolate kept the heat in when the sun dipped behind the cliffs. I rarley respond (positively) to advertising, but that photie has me heading for the kitchen. The thought of that tea has me heading down to Kimmeridge again this week for a repeat performance.